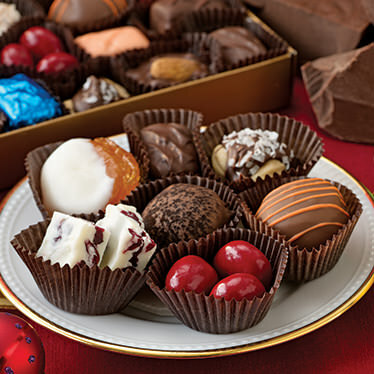 We're sure the chocolate lovers on your gift list will agree, if life is like a box of chocolates, life is really, really good! 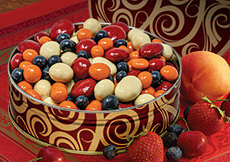 We've packed our beautiful red and gold gift box with an assortment of luscious chocolates from our decadent Truffles to dipped Glacéed Apricots, crunchy Chocolate Fruit and Nut Clusters, classic Liberty Orchards Fruit Chocolates, Dreamlets, and more. Choose from two sizes...or get both sizes tied together with a gold ribbon! Kosher. Gift wrap not available on the Combo. INGREDIENTS: milk chocolate [sugar, chocolate liquor, milk, cocoa butter, soy lecithin (emulsifier), vanillin (artificial flavor)], sugar, semi-sweet cocolate [sugar, chocolate liquor processed with potassium carbonate, cocoa butter, butter oil, soy lecithin (emulsifier), pure vanilla], confectioner's coating (sugar, partially hydrogenated palm kernel oil, whey, nonfat milk, mono and diglyceride and soy lecithin emulsifiers, pure vanilla), nutmeats [walnuts, cashews, almonds, macadamias, pecans, hazelnuts, vegetable oil (peanut, cottonseed, partially hydrogenated cottonseed/soybean oil, and sunflower seed oils)], glaceed apricots [apricots, sucrose, glucose, citric acid, potassium metabisulfite (preservative)], prunes (preserved with potassium sorbate), ultra pastueurized extra heavy cream (cream, carrageenan, mono and diglycerides, polysorbate 80), dried cranberries (cranberries, sugar), panned cherries [milk chocolate, sugar, cocoa butter, whole milk, chocolate liquor, soy lecithin (emulsifier), vanillin (artificial flavor), confectionery coating (sugar, partially hydrogenated palm kernel oil, nonfat milk powder, soy lecithin (emulsifier), mono glycerides, artificial flavor, dried cherries (cherries, high fructose corn syrup, rice flour), gum arabic, modified starch, xanthan gum, red 40 lake, yellow 6 lake, artificial flavor, confectioner's glaze], coconut [with sodium metabisulfate to retain color], raisins, dried apricots (preserved with sulfur dioxide), butter (cream, salt), chocolate liquor, modified corn starch, pectin (pectin, disodium diphosphate, sodium polyphosphate, dextrose, dicalcium phosphate), natural and artificial flavors, candied orange peel (orange peel, invert sugar, citric acid), dried cherries (cherries, sugar, sunflower oil), raspberries, pineapple, fruit juice concentrates (strawberry, cherry, raspberry), soy lecithin, sodium citrate, citric acid, malic acid, red 40, red 40 lake, yellow 6, yellow 6 lake, yellow 5, dextose, confectioner's glaze, salt. (Cherries have been machine-pitted and may contain pits or fragments). ALLERGEN INFORMATION: This product may contain traces of peanuts and tree nuts not listed in the ingredients. 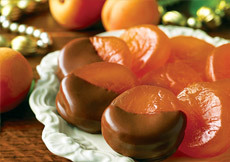 I gave this as a gift, and the recipients raved about it, saying they were the best chocolates they'd ever had. 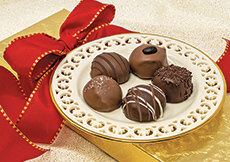 Orchard Chocolates is a delicious assortment of the finest chocolates on the market. If you're looking to "Impress", this is it! DIVINE and worth every penny!